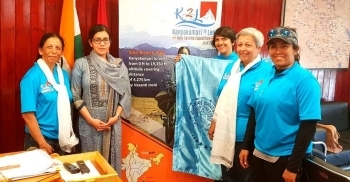 On accomplishment of cycling expedition covering 4040 km from Kanyakumari to Leh in 33 days, Vasanti Jayant Joshi, 56 years old was welcomed by Avny Lavasa, DC on July 3 in Leh. Vasanti Jayant Joshi, 56 years old Professor in the SNDT College, Pune expressed that through this expedition she wants to spread the message of not only shedding all the known and unknown fears but also conquering them and to surge ahead to fulfill dreams. She said that she believes there is an Everest in everybody’s heart and that Everest could be just about anything, from achieving something to being a good person and one needs to have the urge to climb and reach out to that Everest. Avny Lavasa said that her endeavor, willpower and success have set an example and inspiration for the women folks to follow. She wished her good luck in her coming ventures and expressed hope to achieve more success in life.